Vladimir Tatlin’s painting “The Model” was written in 1913 and became part of a series of works by the author, made especially for the Tretyakov Gallery. This group of works characterizes an artist who goes through an uneasy creative way, starting from the everyday mundane description of a body, to the realization that the human body is a complex device that cannot be simply admired. We do not see the face, it is difficult to disassemble the outlines of hair. The artist is concerned more with the geometric plane and volume, and not the model. “The Model” looks closer to the genre of sculpture than painting. The technique and color palette used in this painting testify to the influence of traditional Russian wood engravings, iconography and folk art. 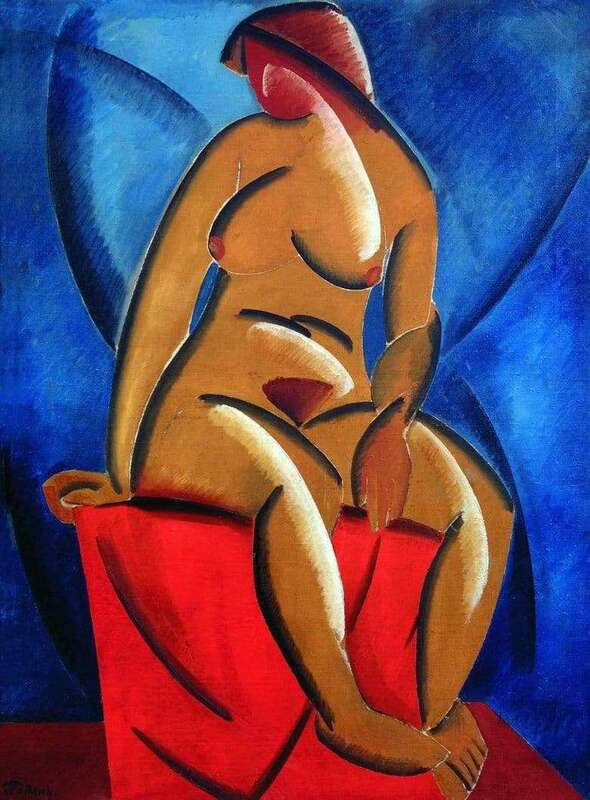 Although there are elements of cubism in Naked, such as distorted perspective and the destruction of forms in planes, this is not a cubist picture. The image consists of curvilinear planes and lines and is close to the plan of the image to the icons of the Renaissance. It should be noted that the use of curvilinear forms continued in Tatlin’s works up to his famous Monument to the Third International. However, a small palette and a combination of white highlights and black contours, clearly traced, refer us to Russian traditional icon painting. Tatlin, it seems, is trying to convey to the viewer that a new icon appears in the picture, replacing the old regime. It is an icon for modern people, naked, inciting them to action, bringing with them inexorable changes in society.